Wine and its popularity have been around for thousands of years. An occasion to celebrate seems a little incomplete without wine. Whether it’s a wedding or just another weekend, a glass of wine makes for a loyal companion. Not only wine tasting but serving wine is also an art. It is important to serve it in the right glass but the most important thing is to serve it at the right temperature. Different types of wine are served at different temperatures so that their flavors and aromas are not destroyed. Also some wines, which contain delicate floral aromas, can burn off if the wine is served too warm. It is also possible that some flavors and aromas of the wine may get subdued if they are served at very low temperatures. It is most important to know which wines are best served chilled and which taste best when served at room temperature. Keeping this in mind, Wine Enthusiast has designed the perfect wine cooler to make sure the guests at your next event love the wine as much as they love your serving skills: the Wine Enthusiast 18 Bottle Refrigerator. Also, Wine Enthusiast gives you a special Wine Enthusiast coupon, which gives you a special discount on your purchase of the 18 Bottle Refrigerator. 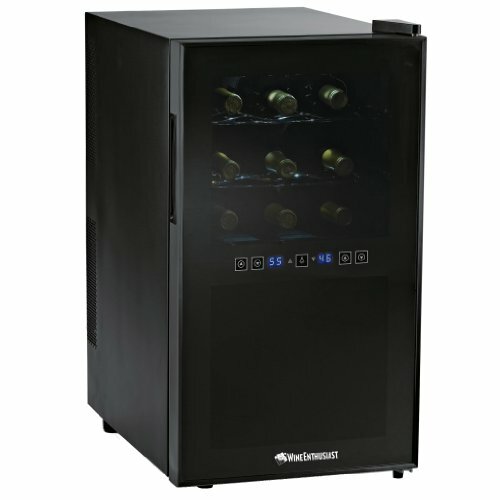 Now you have even more reason to purchase this must-have Wine Enthusiast wine cooler. Lets look at some of the reasons why this wine refrigerator should be on your next shopping list. Store and Serve: This wine cooler has two zones with a capacity of 18 standard bottles where you can store and serve both red wines and white wines. Dual zone: The top zone has an adjustable temperature range of 54°F to 66°F. The temperature in the bottom zone can be adjusted in the range from 46°F to 66°F. Thermoelectric cooling technology: This refrigerator uses Thermoelectric cooling technology, which makes it extremely energy efficient and virtually silent. Also since it is CFC free, there is no harm to the environment. Touchscreen with Digital temperature display: The touchscreen is conveniently located at the middle of the door and it has a digital display for temperature, which allows you adjust the temperature as per your preference. Pull-out shelves:Thereare 4 pull-outchrome shelves, which allow you to store a higher number of bottles. This is especially useful if you want to store bottles, which have a wider circumference. Thermopane door: The door of the wine cooleris a reflective, smoked-glass Thermopane door with a recessed door handle for a sleek and elegant look. Striking looks: The slender design makes sure it fits into any space you desire to keep it in. The cabinet door and doorframe in all black with accents made of stainless steel around the edges make it look extremely stylish. 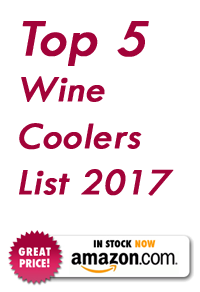 Warranty:TheWine Enthusiast wine coolercomes with a 1-year limited warranty. Irreversible door: The door of the Wine Enthusiast wine cooler is neither reversible nor can it be locked. Since the door does not have a look, it could be a concern for wine collectors who would like to store their vintage and precious wines in this refrigerator. Freestanding only:The back of the refrigerator produces a minimal amount of heat. In spite of this, it is not meant to be inside a cabinet, under a counter or in an enclosed area. It needs to vent in an open area. Less depth of space inside: Though the removable shelves ensure that even storing bottles with wider circumference is easy, it might not be possible to store bottles that are unusually tall since the depth on the inside is less than 14 inches. Temperature may not be low enough for sparkling wines: Though the temperature range means that red wine and white wines will be chilled to the right temperature, sparkling wines need to be chilled to a lower temperature.Most people like their glass of bubbly to be chilled well so that they can enjoy it to the fullest and it might not be possible to do that due to the temperature range of the refrigerator. No light in the bottom zone: Though this does not seem like much of a problem, but when the light in the top zone is on, it might look like the light in the bottom zone is maybe broken. Limited Warranty: Thiswine coolercomes with only a 1-year limited warranty. The consumer today has a wide range of options from wine refrigerators to a customized wine cellar. However, here are a few reasons why the Wine Enthusiast 18 Bottle refrigerator has an edge over its competitors. Perfect size:The Wine Enthusiast wine cooler is the perfect mid-range capacity wine refrigerator. It is not too small like a 6 or 12 bottle wine refrigerator or big like a 24 or 28 bottle refrigerator. This makes it perfect for your home, as it is easy to transport as well. Sleek design: This wine cooler in all black will never look out of place, whatever be the theme or color scheme of your kitchen. Noiseless: One of the most often heard reason why users love this wine cooler is because of how silent it is. Dual zone with temperature control: The dual zone cooling space with temperature control feature keeps both your red and white wines chilled to the perfect temperature. Superior cooling technology: Since this wine cooler is thermoelectric, unlike some of the other models, it uses less energy and this saves your money. It is also CFC free and harmless to our environment. Reflective door: The reflective smoked-glass door protects the bottles from the sunlight as exposure to sunlight for a long duration can destroy the flavor of your wine over a period of time. Removable shelves: Since the shelves are removable, storing larger bottles is possible too. Though the storage capacity might decrease since the bottles have a wide circumference, but since you can remove the shelves it will prevent the labels from being scraped on the large bottles. Also if you have an opened wine bottle, you can remove three racks and store the bottle in the vertical position if needed. Well loved: The amazing features of this wine cooler have earned it high ratings and great reviews on most websites of wines and wine refrigerators. The Wine Enthusiast 18 Bottle refrigerator is a must-have as due to its sleek, slender and more vertical design it can easily fit anywhere, even if your home has limited space. It is compact, lighter than most wine coolers and can be easily transported from one place to the other. The dual zone cooling space has adjustable temperature control, which means that now you can store as well as serve both your red wines and white wines with absolutely no compromise on taste, flavor and aroma. Since it is a thermoelectric wine cooler and CFC free, it is not only easy on the pocket but also environment friendly due to its superior energy efficiency. Its removable shelves allow you to not only store standard size and larger size bottles but you can also store an opened wine bottle vertically by removing three shelves. All these amazing features of thisWine Enthusiast wine coolermake it one of the most popular and highly rated and recommended products online. This wine cooler is reasonablypriced and it comes with a 1-year limited warranty. Go ahead, make the Wine Enthusiast 18 Bottle refrigerator a part of your home and serve the perfect glass of wine to your friends and guests at the next event you host!